Ed Sheeran kicked off his world tour on the banks of the Lee last night and he did not disappoint. 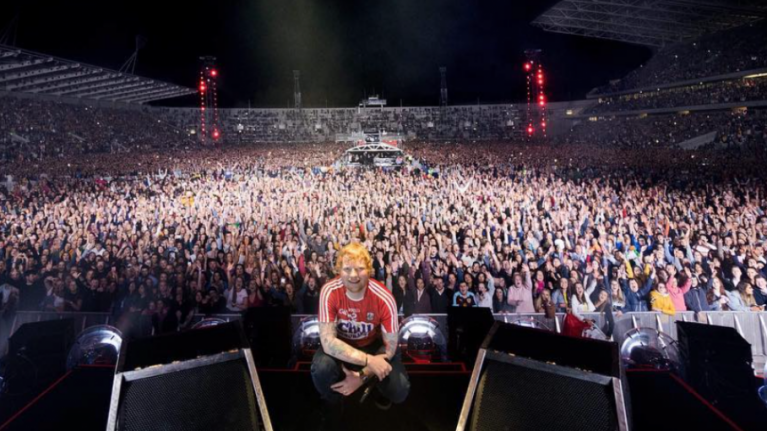 The sun set on a stunningly sunny day in Cork just as Ed took to the stage in Pairc Uí Chaoimh armed with just a guitar, a loop pedal - and a Cork jersey. He kicked off his set with 'Castle On The Hill' to the delight of the 43,000 fans who had broken their hearts to get a ticket to see him. The crowds had been gathering from early in the day and security was tight in the newly refurbished stadium but the good weather and promise of a great night had everyone in high spirits. "Irish audiences are the finest in the world!," Ed called out and looking on, you couldn't disagree with him. The singer arrived in Ireland in style on Thursday night when he landed at Cork Airport in a private jet. He was spotted out and about on Leeside that night, even getting in a round of pints at the Idle Hour bar in Ballintemple. He had a quick dash around town yesterday afternoon too, stopping by the Cork Coffee Roasters in the city. Ed takes to the stage in the venue again tonight and tomorrow night before he moves on up north for the next of his nine Irish dates. He will play Boucher Playing Fields in Belfast on 9 May, Pearse Stadium in Galway on 12 and 13 May and Dublin’s Phoenix Park on 16, 18, and 19 May.